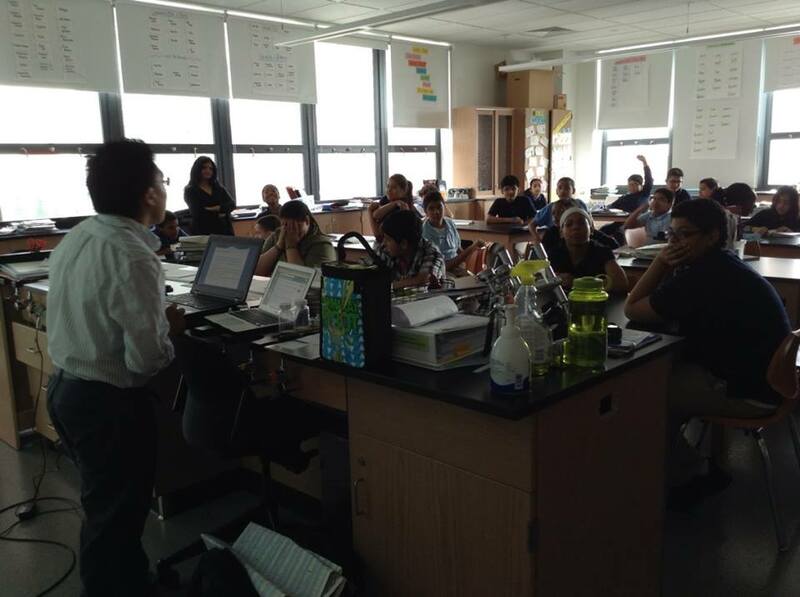 HarborLAB Environmental Science Intern Erik Yax Garcia of Keuka College made a presentation about water quality sampling and testing to the Hunters Point Community Middle School this week. He demonstrated sampling and explained the need for precise, uniform techniques. Then in the classroom he gave a PowerPoint presentation about the science used to identify water quality problems and solutions. Thanks to a grant from the United Nations Federal Credit Union, Erik takes weekly water samples from Willow Lake and Gantry Plaza State Park for pathogen testing at The River Project. He also picks up Bronx Kill samples taken by Randall’s Island Park Alliance. The lab’s looking for Enterococcus, a kind of bacteria that normally lives in human intestines and can therefore reveal the presence of sewage in a waterway. Rainstorms overwhelm our waste water treatment facilities because household water and street runoffs pour into the same tubes and containments. When that happens, raw sewage is released into the estuary in “combined sewer overflows” (CSOs) to prevent disease-bearing foul waters from backing up into homes and streets. Erik’s visit melded with the students’ curriculum, said science teacher Mary Mathai. “Erik Yak’s presentation was very informative. This worked very well since in their present unit of study, we have been talking about the enterococcus bacterial levels in the water and about CSO’s,” she said. Mathai praised how methodical Erik was in his instruction. “He introduced students to the sampling sites in his presentation. He also showed them a video on the CSO’s. This was followed by a demonstration of how water samples are collected with importance given to preservation of the samples and avoidance of contaminating the samples.Photographs of the enterococcus bacteria were shown to students. This was very much tied into what students were learning in the classroom, since they were involved in a project based learning activity regarding CSO’s and water quality in New York Harbor. Students were then taken to the sampling site in Long Island City, where Erik demonstrated the water sample collection. This was followed by a question and answer session,” she recounted. NYC is behind schedule in fixing the CSO problem, but has spent billions of dollars toward that end in recent years. Traditional engineering solutions are termed “grey infrastructure” because they rely on concrete catch basins and new facilities. Another set of solutions gaining favor now are grouped together as “green infrastructure” because they rely on plants and are sustainable and resilient. Green roofs, bioswales, tree pits, and other planting absorb rainwater into soft earth and up through roots so that less pours into the sewer system. 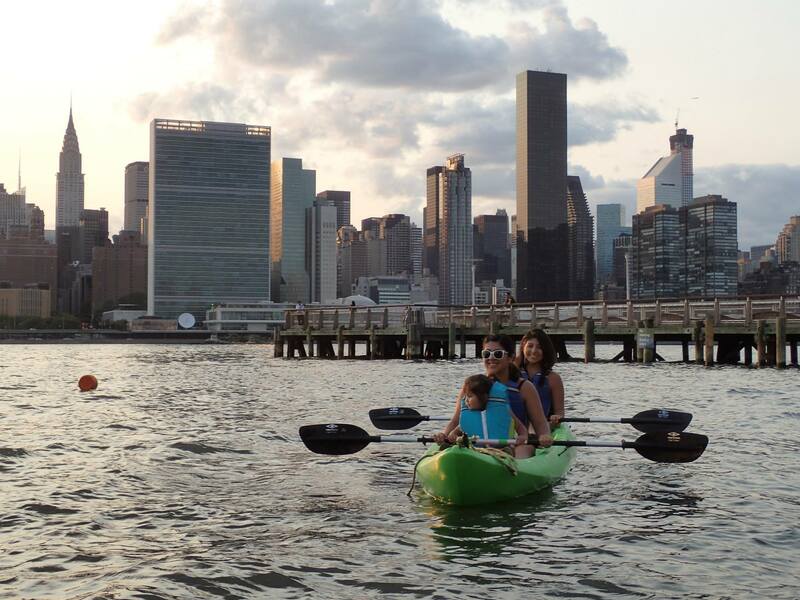 We’re happy to report that water at Gantry Plaza State Park, where HatbotLAB will offer public paddling this summer, has tested as cleaner than other western Queens sites (Hallets Cove, Anable Basin, Newtown Creek) in this year’s first few weeks. This activity is part of a broader “citizen science” project coordinated by the NYC Water Trail Association, a network of paddling and rowing groups that HarborLAB Founder Erik Baard also initiated and co-founded. HarborLAB launch (beige building to the right) on the Newtown Creek from the Pulaski Bridge. 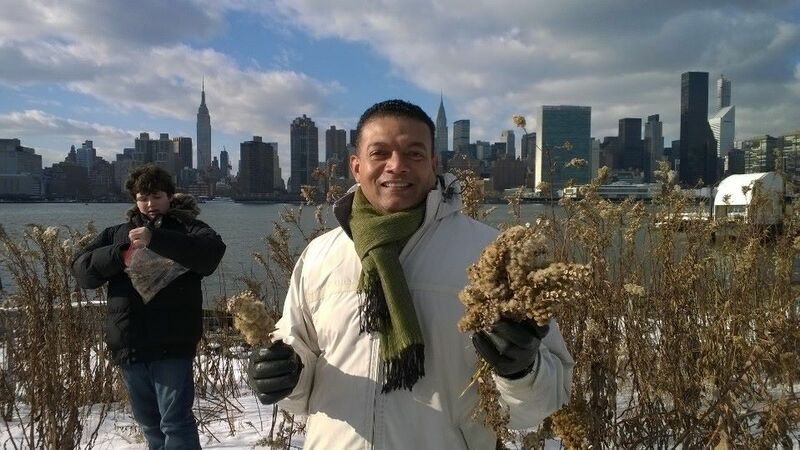 The East River and its branches, like the creek, are saltier and so don’t freeze as easily, but perhaps the creek’s water treatment plant’s outflows and street runoffs are freezing? Photo by Steve Scofield of the Transportation Alternatives Queens Activist Committee (http://transalt.org/getinvolved/neighborhood/queens). 1867 etching of a flow of humanity across the frozen East River. One of eight times the strait froze over during that century. Image via Gothamist (click for link). Ice floes on the East River are a rare sight in recent years, but the Brooklyn Bridge is a daily reminder of how extreme even relatively recent planetary climate fluctuations have been. Let’s explore how that is so, and take a fun detour into the molecular structure of water. When scientists worry about climate change and global warming, they’re not ignoring the fact that Earth has experienced wildly different atmospheric compositions and temperatures over its 3.8 billion years as a living world. What we’re destabilizing, they worry, are the conditions that for 12,000 years have fostered the neolithic agricultural revolution and civilization itself. Some worry that the more energy retained by the atmospheric system (global warming) through higher CO2 concentrations, the more chaotic it might become in mid-latitude coastal areas (our temperate zone) as we become a pass-through for storms that transport energy between the tropics and arctic. But just as a cold snap in one region or continent doesn’t refute the mounting evidence of global warming, it can be argued that we can’t say with certainty that storms like Hurricane Sandy are the result of warming. That said, there are records, written and archeological, of worldwide changes that lasted years or even centuries. Might we enter another “Little Ice Age” like that of roughly 1300-1870? 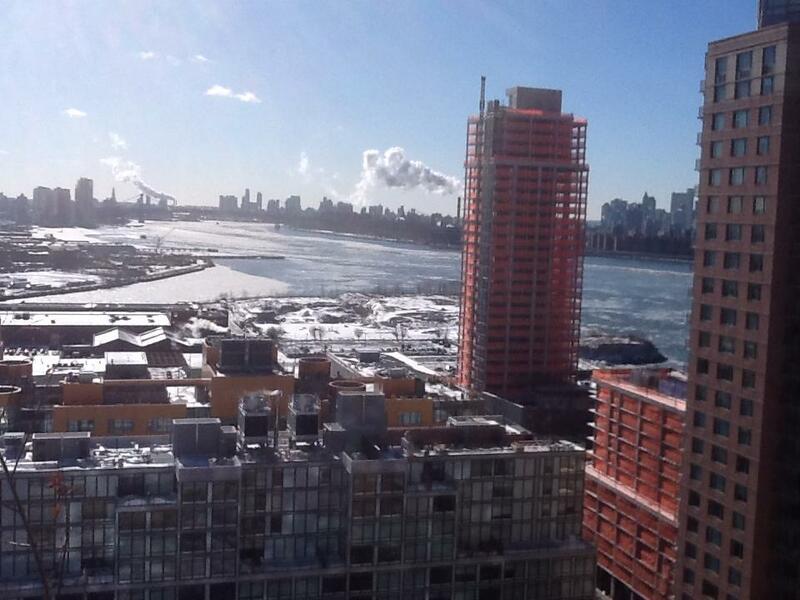 To get an idea of how severe winters of that period could be, several times the East River froze over. 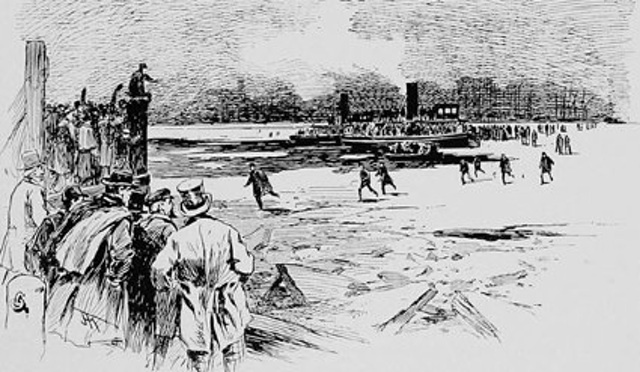 Brave souls walked over “ice bridges” from Brooklyn to Manhattan, but ferries vital to commerce were locked in place. After this happened again in the winter of 1866-67, businesses in our growing metropolis had enough and lobbied hard for a long-contemplated “Great East River Bridge” to keep commerce flowing in all weather. As it happens, the Brooklyn Bridge was completed in 1883, eight years after the East River last froze over solid. In a sense, the Brooklyn Bridge touches down on the shores of two boroughs and on the shores of two climatic ages. And we might have a Brooklyn Bridge because the Sun lacked spots! A few things can cause the planet to cool. Some ascribe the deepest points of the Little Ice Age to the Maunder Minimum, a period sunspots and solar flares were extremely rare. Our sun is in a lull right now, but a 2012 NASA study found that recent solar inactivity hasn’t impacted our planet’s “energy budget” much. A 2013 study by researchers with the National Center for Atmospheric Research (part of the National Science Foundation) and partners concluded that a Maunder Minimum redux wouldn’t save us from global warming. Just as adding carbon dioxide, water vapor, and methane to the atmosphere can warm the planet, kicking up dust and soot can cool it. 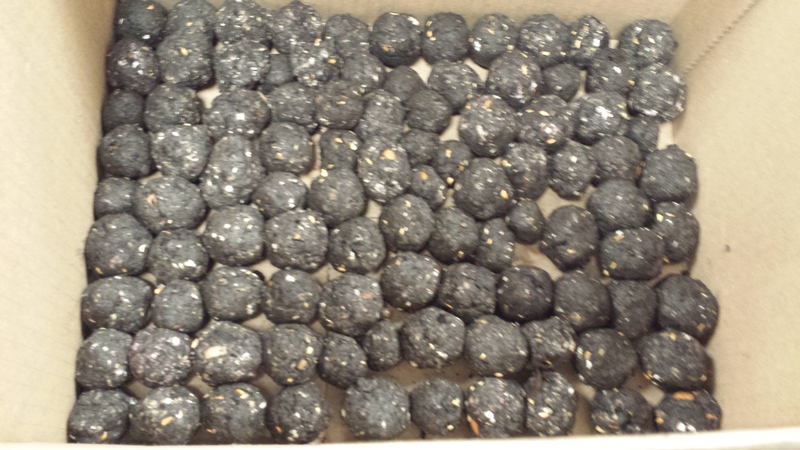 Volcanoes have caused global cooling, as perhaps have asteroids and comets (even beloved Halley’s Comet). Some people even advocate for “geoengineering” projects that would cool the planet, but implementation could bring their own disasters. Besides, Ocean acidification, which could collapse the planetary ecosystem, would proceed apace if we continue to burn fossil fuels, even if we dust up to cool down. 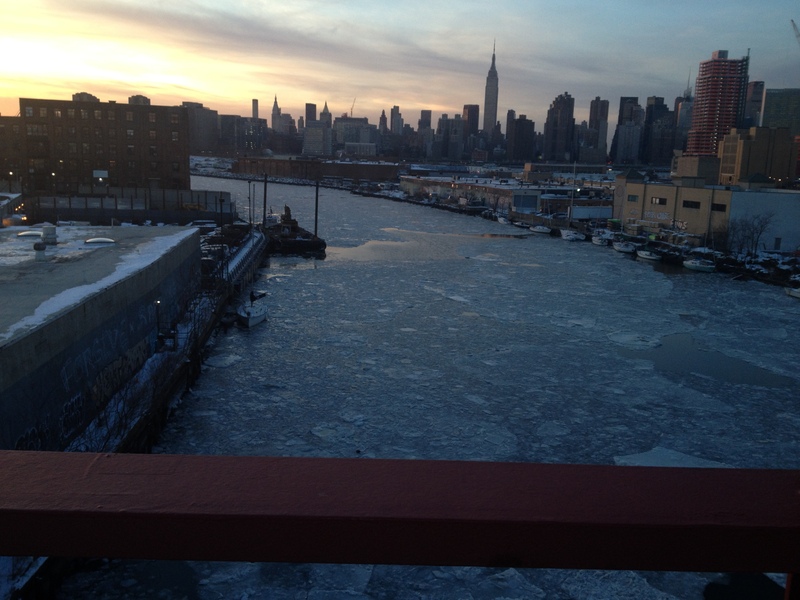 East River ice floes and Hunter’s Point South (and the ice-whitened mouth of the Newtown Creek). Photo by Mark Christie of Friends of Gantry and Neighborhood Parks (http://friendsofgantry.org/). 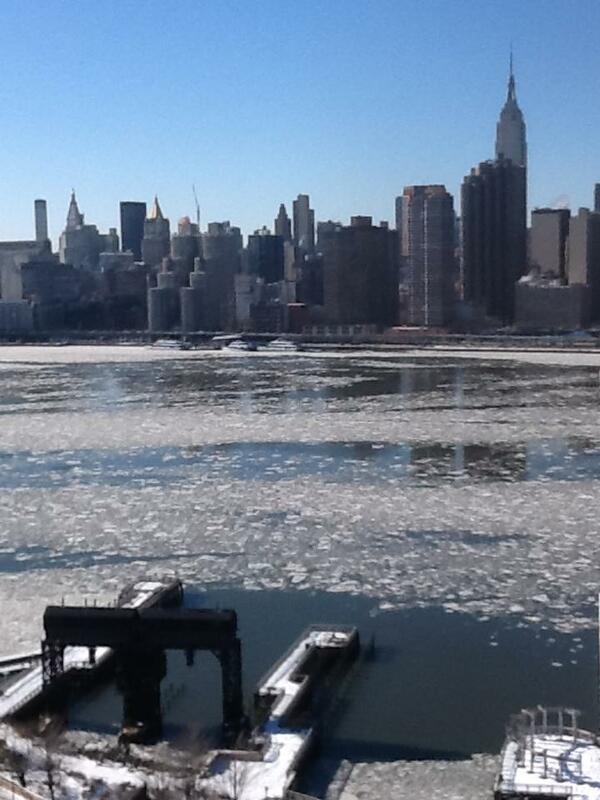 East River ice floes floating past Gantry Plaza State Park in Long Island City, Queens. Photo by Mark Christie of Friends of Gantry and Neighborhood Parks (http://friendsofgantry.org/). 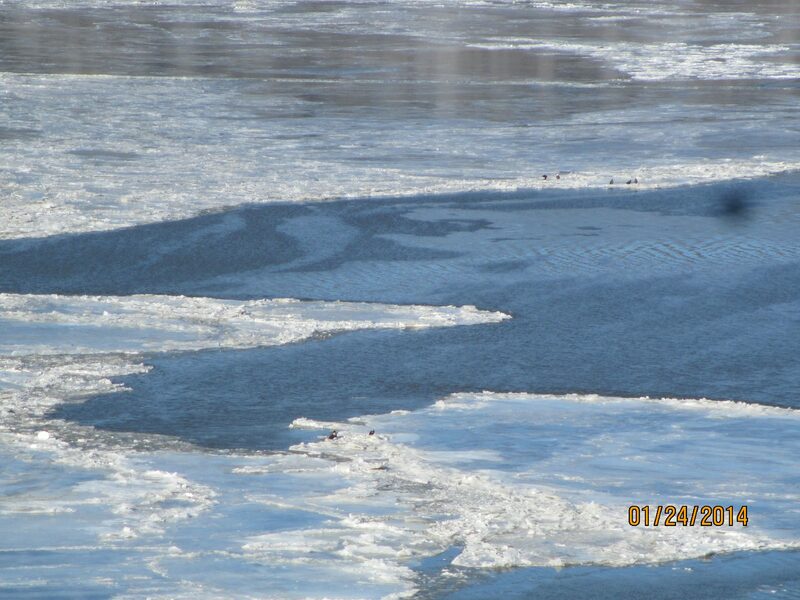 Bald Eagles (those little black dots) on Hudson River ice floes. Photo by David Burg of WildMetro (www.wildmetro.org). 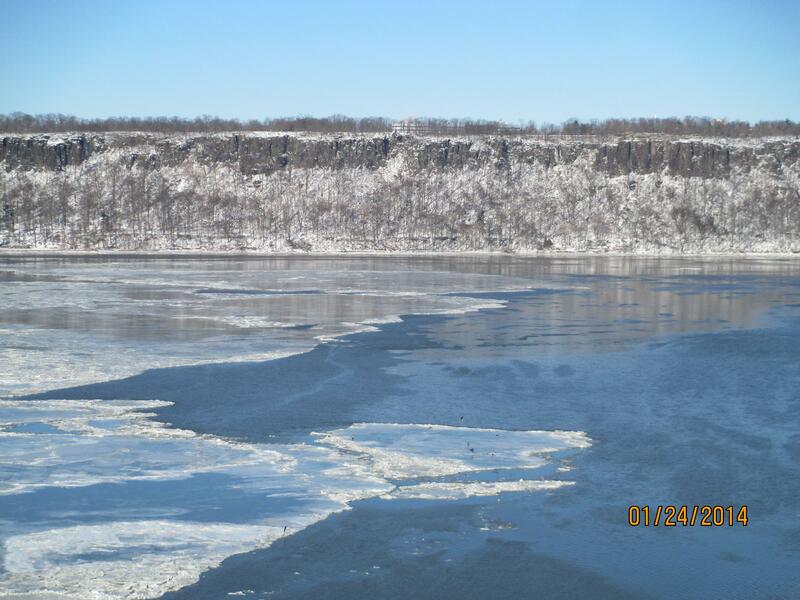 Snow covered Palisades with Hudson River ice floes. Photo by David Burg of WildMetro (www.wildmetro.org). 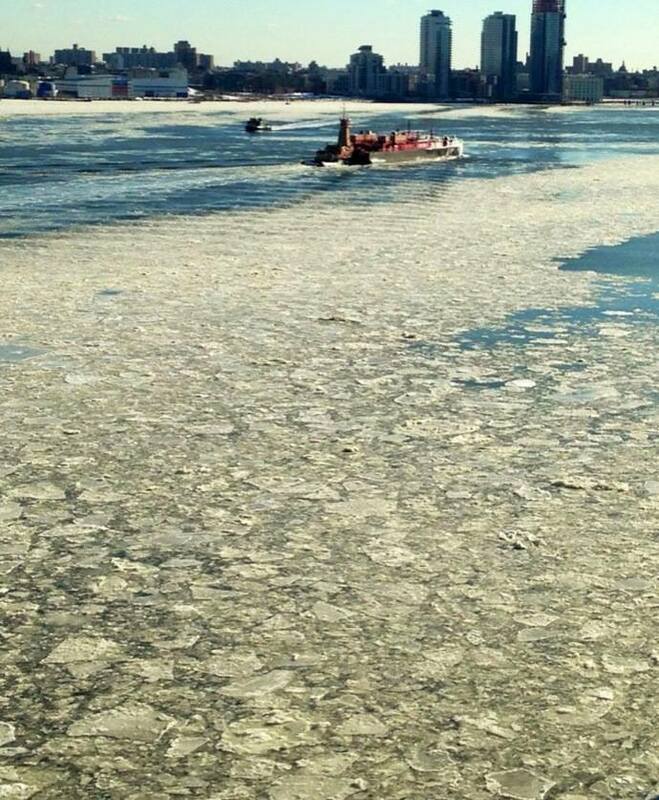 Finally, a fun thing to ponder: What if ice didn’t float?